We had a kind of quick lunch today. 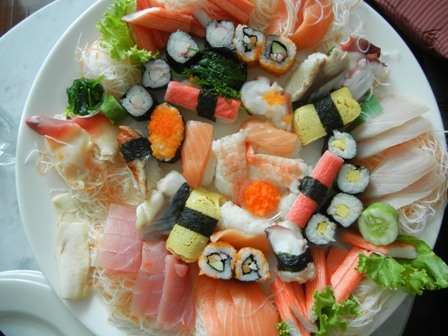 We bought a selection of sushi and sashimi. The question was what wine to have with it? Well, we had not much choice because my wine fridge is almost empty. 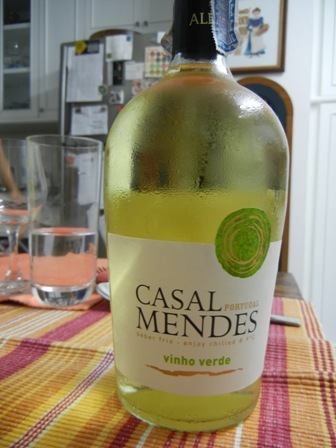 So I picked out of distress (I did not want to take one of my great Riesling wines) the last bottle of Vinho Verde we had, a bottle by Casal Mendes, which can be obtained in Bangkok super markets at relatively low cost. Woh, what a surprise: it worked wonders, I thought. 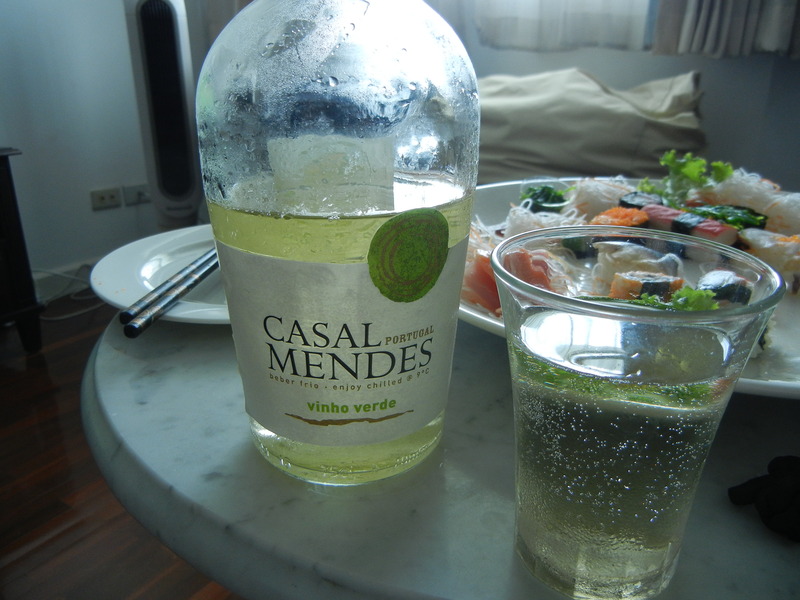 The Portuguese Vinho Verde with its low alcohol and freshness was just the right wine with the raw fish and the rice. What an excellent choice this was. I highly recommend to try this pairing of Eastern food with Western wine. At the end of the dry season in tropical Bangkok temperatures reach above the 40 Celsius. Fortunately, the humidity is rather low at this time of the year, at least before the casual tropical rain shower goes down. These showeres become more and more frequent over the next weeks until the transition to the rainy season is completed. 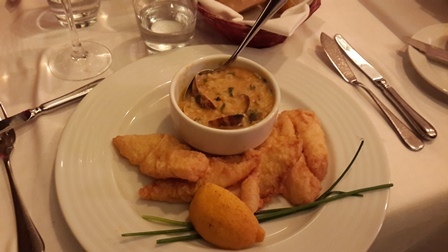 Therefore, light lunches are the go. 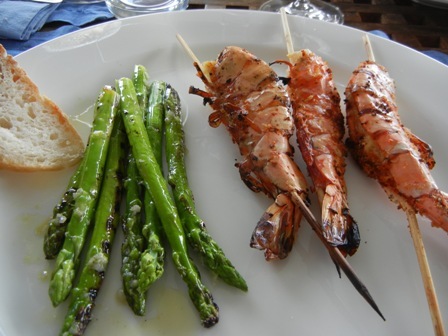 Nobody wants rich and filling food but instead prefers salads, grilled vegetables and maybe something fresh from the water. Regarding the wine selection low alcohol Riesling wines are my preferred choice. 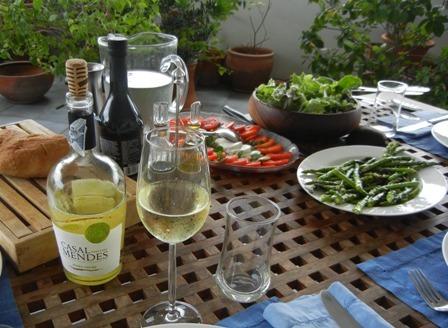 But another wine which is ideally suited to the conditions are whites from Portugal, especially Vinho Verde. 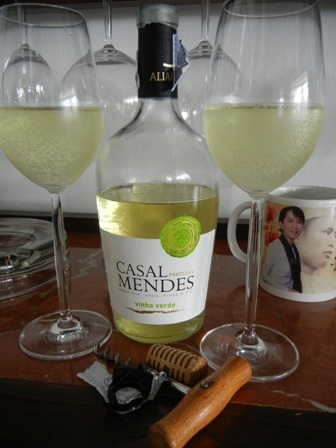 Fortunately for us in Bangkok some Casal Mendes Vinho Verde is available. 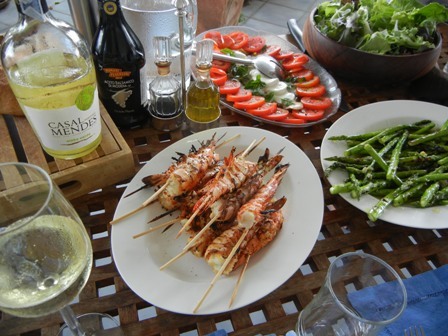 We had such a lunch last Staurday, with grilled green asparagus, an insalata caprese, and some grilled scampi. 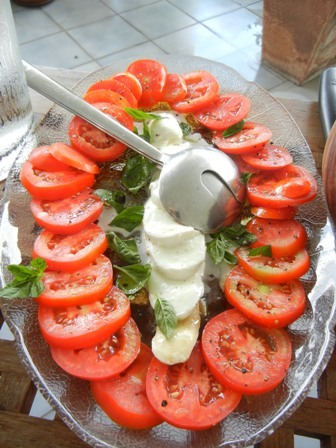 The olive oil we are using is of first quality. Needless to say the disheses were just delicious. 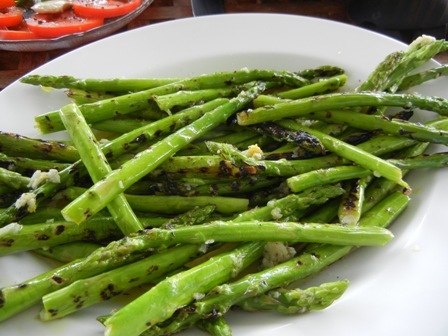 It is the asparagus season in Germany and I had the opportunity to indulge myself into quite a few “asparagus orgies”. Fresh white asparagus is so delicious. 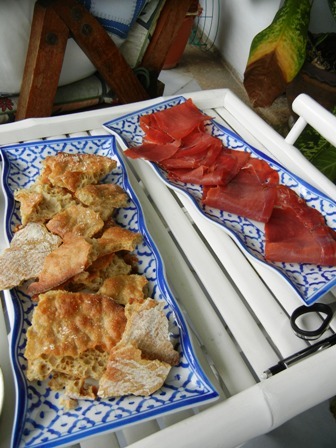 I like it with just some melted butter, a few potatoes, and maybe some fresh German ham. – ‘2008 Grüner Veltliner Hundschupfen, dry’ by Weingut Hagn, Mailberg, Austria. 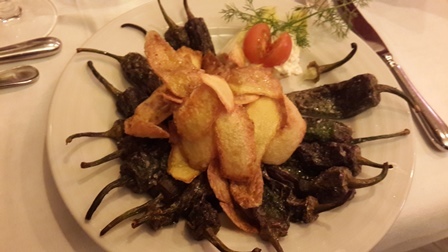 I have not tried any of them as yet but reading the review brought tears to my eyes, my nose was hallucinating, and my taste buds seemed to feel the crispness of the wines. Recently, my friend Holger from Berlin had given us a bottle of “Francis Coppola wine”. I had never tasted anything from this producer though I have read a couple of reviews on the net. Therefore, opening this bottle of Pinot Noir and enjoying it with a Sunday roast (chicken this time) promised to be an exciting experience. The ‘2006 Francis Coppola, Diamond Series, Silver Label Pinot Noir’, originates from Monterey County, a cool climate wine region in central California. During an Agricultural Economist Conference in 1997 I had the opportunity to visit this wine region. It’s a marvellous place and I treasure my memories of tasting various delicious boutique vineyard wines. So tasting wine from this part of the world was exciting indeed. 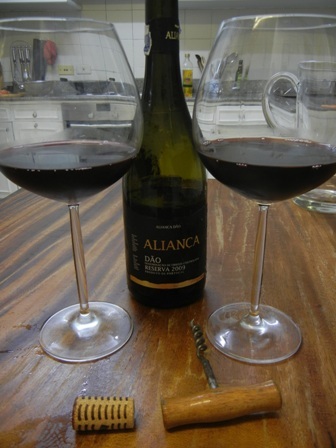 We do not drink very many wines from California so this wine extended our experience with USA-wines. Ratings of the 2006 vintage vary (87 or so points), but it is definitely not one of the best Californian Pinot Noirs. 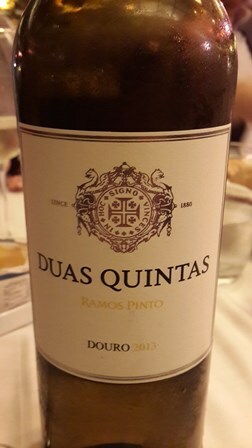 However, the price of US$ 20 in the USA indicates that there is quite a market out there for this “very drinkable” drop. 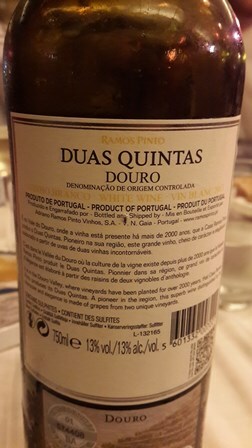 The medium-bodied wine showed plenty of fruit on the nose (cherries, raspberries), it felt silky in the mouth with some forest flavours, and displayed a nice finish. No bitterness could be detected as some tasters have reported earlier. To my taste buds the pairing of lemon chicken with Pinot Noir worked well. What a pleasurable tropical afternoon on our terrace we had. The 38 degrees Celsius did not feel that hot but the dry-hot seasons has definitely started. After the meal I had a port wine. I always liked port. Our visit to Porto last summer re-enforced this passion. With the port (10 years old), I smoked a cigar from Nicaragua, a hand made ‘Casa de CT Torres, Nicaragua, Hecho a mano’. The “smoke” was very pleasant, not to heavy; the tobacco was mild but distinct. I should buy more cigars from Nicaragua. Cigars relax me and that is what I needed between two very busy work weeks, some relaxation. Also the bad news that we would not have a vintage this year at Two Hills Vineyard needed to be digested. Well, so is nature, unpredictable, unsteady, volatile, but marvellous.